Arclight Films, MEP Capital and the South Australian Film Corporation (SAFC) have announced that production has commenced on the true-life prison break feature film Escape From Pretoria. Daniel Radcliffe (Harry Potter, Jungle, The Woman In Black) and Australian actor Daniel Webber (The Dirt, 11.22.63, The Punisher) star as political prisoners and freedom fighters Tim Jenkin and Stephen Lee. 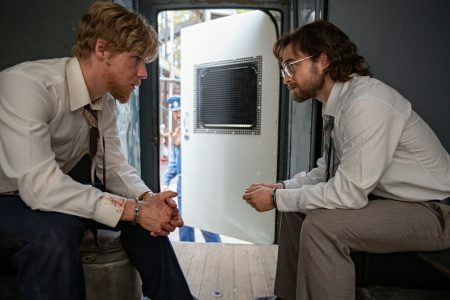 A ‘first-look’ image from the production featuring Radcliffe and Webber has been released. UK actor Ian Hart (Mary, Queen Of Scots, God’s Own Country, Land and Freedom), Mark Leonard Winter (Pine Gap, Cleverman, Balibo) and Nathan Page (Miss Fisher & the Crypt of Tears, Miss Fisher’s Murder Mysteries, Underbelly) join the cast. Based on an extraordinary true story, Escape From Pretoria follows Jenkin and Lee, two white South African twenty-somethings who were branded ‘terrorists’ and imprisoned in 1978 for their involvement in covert anti-apartheid operations for the ANC (African National Congress). Incarcerated in Pretoria Maximum Security Prison, Jenkin and Lee – joined by a fellow inmate – decide to send the regime a clear message and escape. After months of meticulous surveillance, breath-taking ingenuity, and in a race against time as the authorities strengthen the prison security defenses, the group craft wooden keys for each of the ten steel doors between them and freedom. Francis Annan makes his feature film directorial debut from the screenplay he co-penned with LH Adams, based on Tim Jenkin’s autobiography Inside Out: Escape from Pretoria Prison. Escape from Pretoria is produced by Arclight’s Hamilton and Michelle Krumm and BeaglePug’s David Barron (Kenneth Branagh’s Cinderella, Harry Potter, Mary Shelley’s Frankenstein), Footprint Films’ Mark Blaney (This is Not A Love Song, Africa United) and Jackie Sheppard (Africa United). “Footprint Films and BeaglePug are thrilled to be working with the SAFC, Arclight Films and MEP Capital to bring to life one of the most daring and ingenious prison escapes of the twentieth century,” said UK Producers David Barron, Mark Blaney and Jackie Sheppard. “We’re also very excited to be working with the immensely talented Francis Annan and our outstanding cast on this astonishing true story. Escape From Pretoria will be post-produced in Melbourne, having received support through Film Victoria’s PDV incentive program. The film is an Australian/UK co-production between Hamilton Entertainment, BeaglePug, and Footprint Films.